We took a taxi to the nearby town of Elounda today where we enjoyed gyro pitas for lunch. 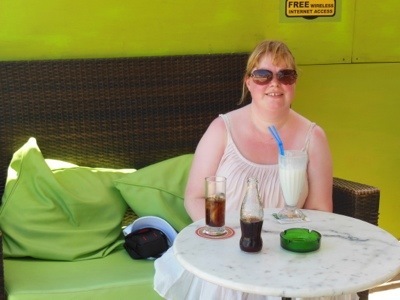 It was probably the warmest day today with 35 degrees Celsius so the vanilla milkshake with the lunch tasted fantastic! After dinner and drinks in the bar we went back to our room to take a evening bath in the pool. The sun had almost set so the pool’s lighting were on. Made a very cozy environment to swim in. While swimming a band suddenly started playing so instead of me walking out of the pool Mathias jumped in and we enjoyed the music for a bit. It was possible to see the band and the disco lights from where we were but I can’t say I saw much as I’d taken off my glasses by then. It was very cool with a little evening dancing in the pool to live music before bedtime.